After seemingly weeks of endless strong westerly, north-westerly or northerly winds bringing snow and hail most days, we were overjoyed when the wind finally swung round to the east. After a day of slack weather, however, it picked up again, as a cold force 6-7 blew through, although still from the right direction. I had a pretty decent morning's birding while carrying out the northern census route, with some wildfowl moving offshore, some pristine full summer-plumaged Snow Buntings, a Black Redstart and a Merlin which caught a Starling right in front of me. 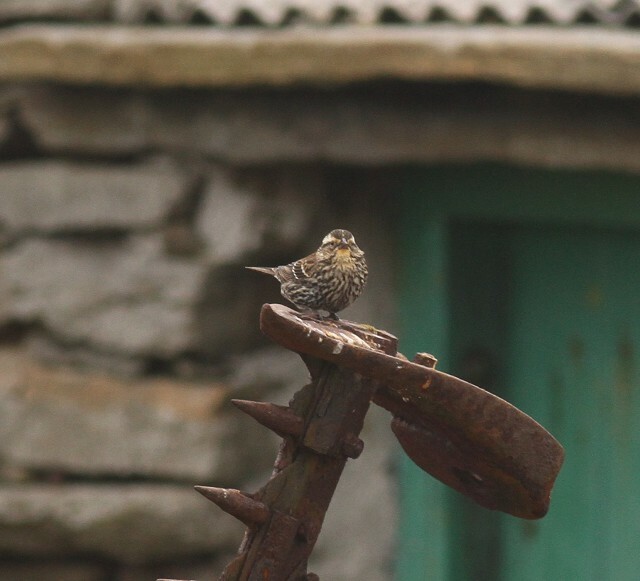 I was walking back past the house at Garso with my mind half on what we had to do in the afternoon to get the ‘obs’ ready for a tour group, when a strange little chup call spun me round in time to see a Starling-sized bird land on top of some gas bottles outside the house. 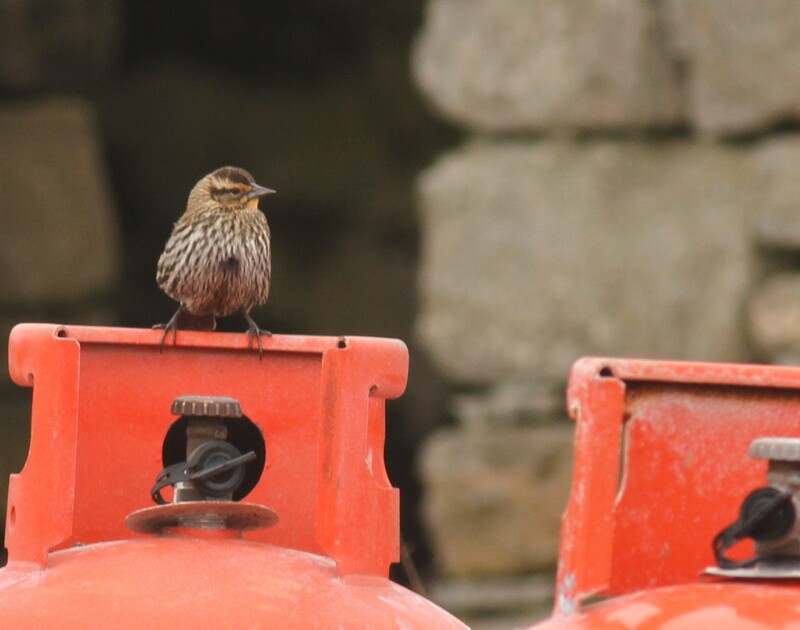 Red-winged Blackbird, North Ronaldsay, Orkney (Simon Davies). I took a few steps to my right and could see the whole bird about 15 m away. It was indeed a chunky passerine with dark crown, broad, flaring supercillium, yellowish at the front, a dark eyestripe and a yellowish chin patch with dark, bold streaks down the front (slightly thinner in the centre) – the thought ‘calidus Peregrine-style’ bizarrely popped into my head! The two white wing-bars were also obvious, as were the chestnut scapulars and mantle. It was a stunning bird, despite being brown and streaky. After a few minutes, it flew up with a really distinctive, floppy flight and showed a fan-shaped tail, which also flopped around as it flew up onto the wires, where it perched for a minute or so before dropping down into a nearby iris bed. 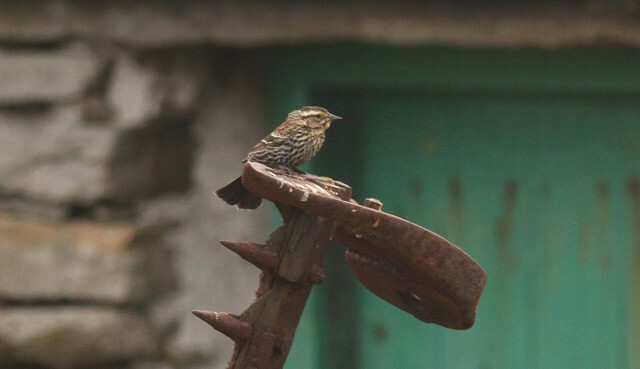 I found some shelter from the wind and began to phone the obs volunteers, who were working other parts of the island, relaying a message reading something like: “Odd bird at Garso – it’s American and mega. Not 100 per cent sure what it is but best guess is Red-winged Blackbird.” My colleague Larissa helpfully asked: “Is it black with red wings?” “No,” I replied. I had now lost the bird and failed to re-find it before Sam, Larissa and Harris arrived. After what seemed like ages but was probably only 15 minutes, it flew up from the irises to make a beeline straight back to the gas bottles, where we all had excellent views. Larissa, being Canadian, was probably best placed to help with the ID and tentatively agreed with my first thoughts, as did Pete Donnelly, who arrived shortly afterwards. I then tweeted back of the camera pictures out into the world, and that was that! Kevin Woodbridge and Alison Duncan were off island for the day (as they always are when rare birds are found! ), but they arrived back on the last scheduled flight of the day and soon had great views of the bird as it followed the pattern of heading to and from the gas bottles. The phones were red hot for the rest of the evening, with people booking in, making plans and congratulating us, while we sat back and relaxed with a beer or two. The first planes arrived at 9.30 am the next morning, and with the bird sticking to its routine everyone connected and had great views. There were some adverse internet comments regarding the organised flushes, which occurred a minimum of 1.5 hours apart (though usually much longer than that) and were undertaken by just one obs staff member at a time. This strategy was designed to minimise disturbance to the bird, the habitat and the privately owned land it was frequenting, with the alternative being every plane load of folks fanning out and trampling through the area, disturbing breeding birds – and of course the blackbird itself. As I write, the bird is still present, with everyone who has come having a great and successful time of it. The phones are still ringing with more bookings, newspapers and radio stations all wanting a piece on this potential first for Britain and the Western Palearctic.